noted: How to keep a newfie cool and other challenges! 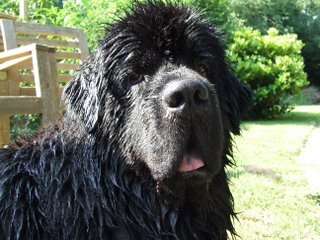 When it's 30 degrees, there's really only one thing newfies want... water! It's almost too hot to take the girls out in the car to find a river etc, so a bit of a play with the hose pipe will have to suffice on some days! Although Chloe hates being hosed and skulks back indoors afterwards, Lola loves it! I've just discovered this blog with some fab challenges, including the current one to create a page using at least 15 stickers. Did mine last night and managed to included 56! Promise I'll scan and upload later today!